This 68 year old gentleman had extremely worn down teeth. He had lost most of his back teeth many years previously and had failed to have them replaced. As a result the remaining, mainly front, teeth were over used and this led to the marked wear of the teeth to such an extent that the front teeth were barely visible on smiling. He asked to have his chewing ability and appearance improved. After restoring his chewing ability by providing him with partial dentures to replace the missing teeth, his upper teeth were rebuilt using crowns whilst the lower teeth were rebuilt using composite veneers. This young lady has two of her side front teeth missing. 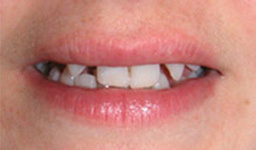 This is a common congenital condition when certain teeth fail to develop. Her appearance bothered her considerably due to the gaps present and the 'pointy' canine teeth being too far forward and made her very self conscious. Using a combination of crowns, bridges and veneers we were able to create the smile she had longed for for many years and with it the confidence to smile broadly. 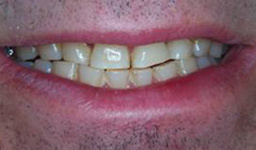 This 44 year old gentleman has had extensive dentistry in the past but was unhappy with the appearance of his smile. 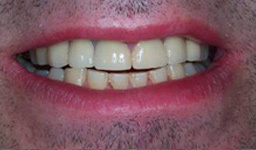 He disliked the colour of the existing bridgework and wanted to improve his smile with the closure of the gaps between his natural teeth. 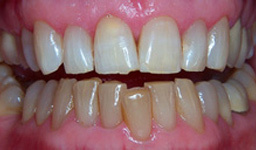 A combination of crowns and veneers, and replacement bridgework corrected the disharmonies. This young man in his early thirties has marked wear of his teeth as a result of grinding his teeth particularly during his sleep. 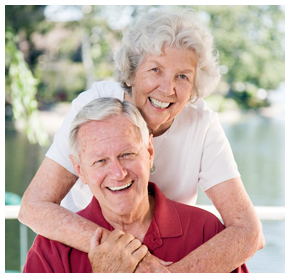 Gradually his teeth have worn away and shortened so they were becoming uneven and difficult to see during normal speech and smiling which can have the effect of ageing an individual. Crowns have been used to rebuild the natural structure and appearance of the upper teeth creating a stronger, more youthful appearance. 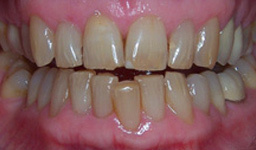 This 40 year old lady has loss of the enamel on the face and the biting edges of a number of her teeth. She was concerned about the irregular shape and the unsightly yellow colour of her teeth where the enamel had been lost. 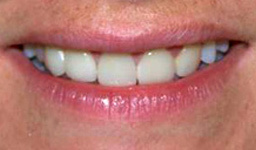 We used bonded composite laminates to rebuild the damaged areas of her teeth to give a much more aesthetic appearance. Both of these cases show the wonderful results that can be achieved with the Optident Whitening System that we use at the practice. The photographs show the before, midway (when only the upper teeth have been whitened) and final stages of the procedure to indicate the range of improvement that can be achieved to produce a smile you will want to show off!